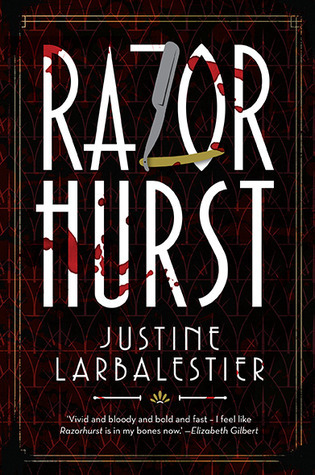 Razorhurst is a young adult historical mystery with paranormal elements. The book looks the female experience of history and presents an intersection of gender, race and poverty through a brief snapshot of Surry Hills 1932, a time where the now gentrified neighbourhood was filled with poverty, suffering and violence. Kelpie is an urchin who knows little about who she is, and or even how old she is. She wants to be able to read but must settle for surviving on the streets. What Kelpie does know is that she can see and speak to ghosts. These ghosts have helped her stay alive, warning her about danger and helping her find food. Not all are friendly though, especially not in the slums of Surry Hills, and Kelpie is tormented by her inability to block these ghosts out. Dymphna is mob boss Gloriana Nelson's "best girl", a glamourous and ambitious prostitute who has caught the eye of rival boss Mr. Davidson. Dymphna is clever, charming and plotting to become a boss herself, but she has a secret, like Kelpie she can speak to ghosts but completely ignores them. When the two girls meet it is over a dead man's body: Dymphna's most recent boyfriend. His ghost is intent on helping them as Dymphna takes Kelpie under her wing and the two try to escape ending up ghosts themselves. A fast-paced, intriguing exploration of the tragic circumstances young girls can experience. As Kelpie and Dymphna race to escape the inevitable violence gang infested slums offer they discover unexpected secrets and offer snapshots into the lives of the inhabitants of 1930s Surry Hills.